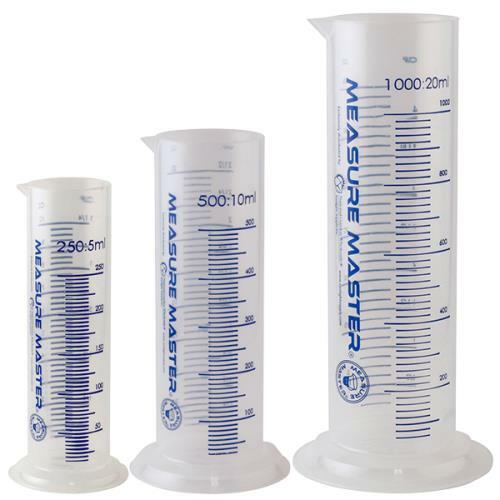 The Measure Master® Graduated Cylinders are a version that differ from traditional graduated cylinders you are used to seeing because these are a little bit wider and shorter. With this construction the wider base provides more stability and easier adding or pouring of liquids. The reduction in height allows for easier storing. Unlike most graduated cylinders which read metric measurements only these include metric milliliters, ounces and cups. Each cylinder is translucent for easy viewing of liquid levels. Imprinted on these cylinders are a raised scale and numerals for easy reading. The 250 ml units measure in 5 ml increments, 500 ml unit measure in 10 ml increments and 1000 ml measures in 20 ml increments.